Is the Time Right to Add Automation? Home › Executive Corner › Is the Time Right to Add Automation? Today we have a special guest post from Scott Stone, E-business manager for Cisco-Eagle, Inc., a provider of integrated material handling and storage systems for industrial operations. In anticipation of the 2014 holiday season, e-commerce giant Amazon reportedly deployed an “army of nearly 10,000 robots” to its distribution centers worldwide. Nasdaq notes that the deployment of robots en masse strengthens Amazon’s same-day or overnight delivery services due to the decreased time spent sorting and packing products. In other words, the robots help Amazon meet increased demand during the peak holiday season, when it sees spikes in customer traffic. For Amazon, this type of automation is a no-brainer, particularly with holiday sales accounting for such a major portion of the company’s annual revenues. But what about mid-sized companies who are on the fence about automating warehouse operations? How do these organizations know when the time is right to automate and, more importantly, what do they need to know prior to making the investment? Cost reduction: Companies may experience “sticker shock” when they look at the initial costs of automating part or all of their operations. In reality, automation such as robotics, vision systems, software, carousels, conveyors, and other automation systems has become much more affordable in recent years, while almost all other costs (labor, space, time, energy) are increasing. Notable is that the automated solutions are also much better than they were a decade ago—they can do more now at a lower cost. It’s important to consider the long-term investment, not just the immediate payback, when you make decisions about automation. The basic formula of replacing or reducing multiple shifts of workers with a $200,000 palletizer, for example, can be intimidating until you do the math. Ask yourself questions such as these: Does the robot cost more over its expected life than the labor does? How could you save on labor costs elsewhere in the warehouse by freeing up expensive manpower for more valuable work requiring the human touch? Does it remove workers from potentially dangerous work that could create a crippling accident or long-term stress/strain injuries? Manufacturing skills gap: According to U.S. Department of Labor estimates, the median age of the manufacturing workforce rose from 40.5 years in 2000 to 44.1 years in 2011. What’s more, the Society of Manufacturing Engineers “predicts that the shortfall of skilled workers could increase to 3 million jobs by 2015 due to the aging manufacturing workforce,” as noted by Steve Norall from Cerasis. What this means is that there’s an increasing opportunity to automate warehouse tasks as many older skilled workers consider retirement. While it’s impossible to automate every job, finding ways to reduce labor hours (particularly the least value-add hours) is one way to proactively attack the skills gap. If you need fewer unskilled workers, you can concentrate on ways to train and retain skilled workers. Warehouse efficiency & safety: Let’s face it: Even the most efficient workers can’t compete with automated robots that do their work tirelessly and perform consistently without ever needing breaks. Consider this scenario: What would it take to use a minimum of three strong men per shift who would stay out of one another’s way while lugging a heavy five-gallon can off the conveyor, over to the pallet, and into a stacked position – over and over again. The manpower required to perform at the same level as the robotic palletizing system would be nothing short of superhuman! Aside from increased efficiency, automated systems can also alleviate ergonomic and safety concerns facing workers in the warehouse. According to the Occupational Safety & Health Administration (OSHA), musculoskeletal disorders (carpal tunnel syndrome, tendinitis, muscle strains, lower back injuries, etc.) are one of the leading causes of workplace injuries and illnesses. Even scarier is the number of worker fatalities reported federal and state OSHA: 4,405 in 2013 alone. Increased production: It goes without saying that the key to successful warehouse operations is smooth, efficient product flow. But what happens when, for example, the inevitable bottlenecks form along the conveyor line? 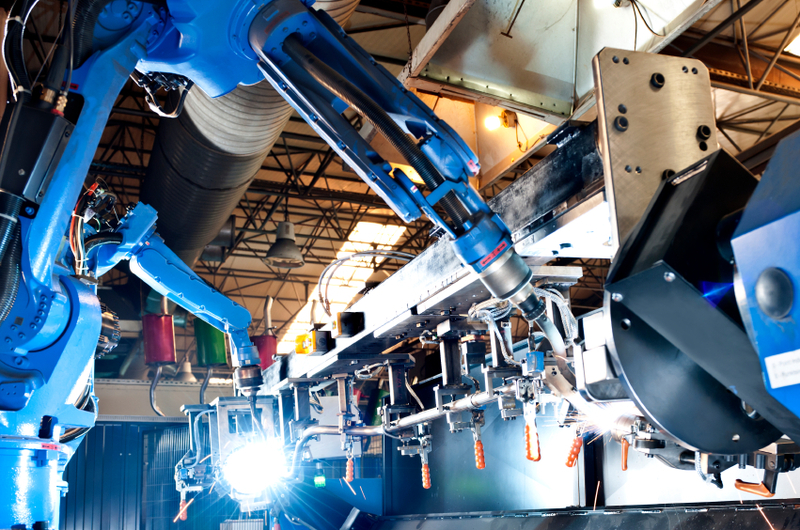 What can you do to keep product flowing to machines and maximize throughput? Because bottlenecks can occur with manual picking, adding picking automation to the conveyor line can speed up throughput, drive down costs, and improve accuracy. Apply this Pareto formula to your order volume to help understand when to add pick automation: When 20% of your sku’s make up 80% of your single piece orders, automation is much more viable. The reason is that the volume of those 20% of total sku’s is moving at phenomenal rates – rates that if picked manually will slow down your order fulfillment time, especially when you’re seeing low piece counts per line item in making up those orders. In today’s competitive, consumer-driven marketplace, the question is perhaps not whether to add automation to your warehouse operations but when to add automation to your warehouse operations. The above are just a few of the factors to understand when you weigh the long-term benefits and costs of automation. It’s also important to consider how the needs of your facility might change over time and to map out what sort of automation technology you’ll need to drive efficiency and productivity in the future. Is your business automating operations? What sort of factors went into the decision to automate? Reblogged this on Mencom corporation. A great read and insight.